Good luck with your two month residency in Germany (where are you going to be? ), it will be very nice to hear how it’s to cross the border so often! 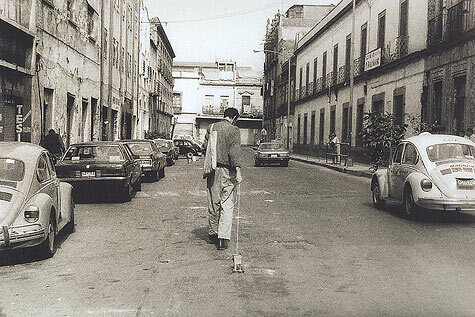 I’m posting a picture of Francis Alÿs and The collector / El colector. In his actions, he is constantly moving, migrating, using the city as a 3D map. The city is the base to collect objects, or to disperse them (see The Paradox of Praxis ). I ‘m imagining that you can attach a big magnet to you, so each time you cross the border, invisible, minimum, discarded objects get attached to you, as a translator of your experience.